- Sari Colt on 六月 1, 2016. 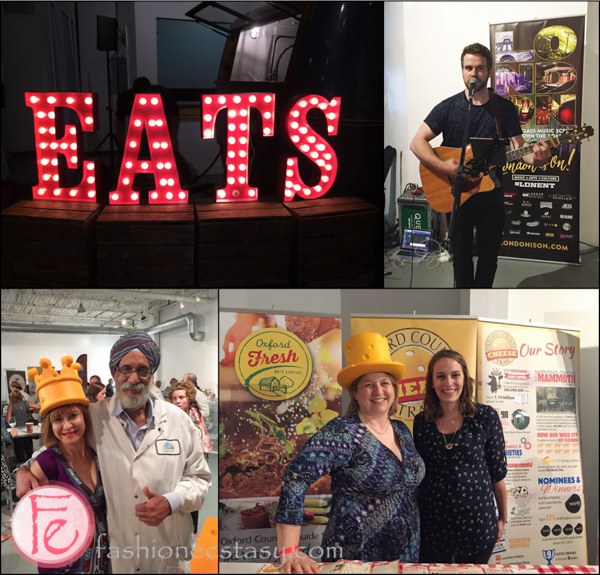 The 2nd Annual Ontario Southwest City Fare, produced by iYellow Wine Club and Ontario’s Southwest Tourism, was held at Toronto’s 99 Sudbury event venue. Over 40 vendors from Ontario’s southwest region showcased their wonderful offerings of food, wine, cider, and beer. There was so much to sample and experience. We had the chance to meet so many talented purveyors of food and drink products, and most importantly, try everything the had to offer. There were Bourbon Street Caesar, Red Neck Caesar, and chicken breast with fried goat cheese ball all from Debb’s Cuisine on Queen. The Blue Elephant Brewhouse offered their Awesome Sauce ale, Northshore lager, Strawberry lager paired with homemade “beer cheese” and sweet potato pudding. Their beer cheese was quite unique and tasty. Sunshine Farms showcased their zesty pickled asparagus, which was very tangy. And being a big fan of gourmet popcorn, we really enjoyed the toasted caramel variety from Original Kettle Gourmet Popcorn. The Cider Keg‘s strawberry rhubarb cider was really flavourful and a great mix of sweet and tartness. We also tasted delicious Wild Pear cider from Bains Road Cider Company. Ramblin Road Brewery Farm had their Country Cream ale, Dakota Pear ale, IPA Unleashed, Country lager, Country pilsner, and Pure Breed all available to try out. The whisky infusions were quite interesting. Available in vanilla, coffee, hazelnut vanilla, chocolate, and toast applewood, these added a flavour kick to the whisky shot. Strathroy Brew Co. had their gluten free 1815 Lockstock ale. Smackwater Jack’s Taphouse offered their dishes: The whole pig double smoked bacon dip with chipotle pork pinds and smoked duck on cinnamon bread with Stilton Cheese. They went well with the Refined Fool Brewing Co‘s Troll Troll cream ale. Bonnieheath Estate Lavender & Winery had their lavender Herbs de Provence along with their Folkin’ Hard apple cherry cider, Folkin’ Hard apple cider, 2015 Sweetness white wine and 2014 Marechal Foch red wine. Burning Kiln Winery ‘s 2012 Cureman’s Chardonnay and 2013 After Party Syrah were quite popular. Belgian ales were available from New Limburg Brewery including their Belgian Style blond ale and Dubbel trappist style. The Combine offered their perch taco, which was served on a corn tortilla and with butternut aioli, pickled salsa, avocado cream and fried lemon. It was outstanding. 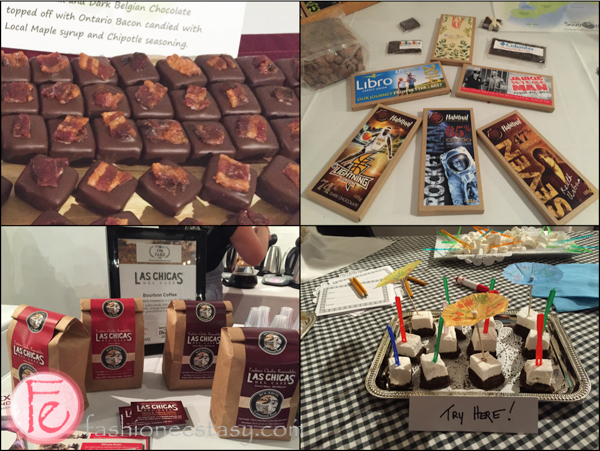 While tasting the pretzel bites, original toffee crunch, and sponge candy from Régine Fine Chocolates, we also learned about the history of the underground railroad in Chatham Kent, bringing the African American slaves to freedom in Canada. From the Windsor Eats area, there was so much to try, including: Sprucewood Shores Estate Winery riesling, Walkerville Brewery milk stout, Brew Canadian maple beer. We paired thwm with sixthirtynine‘s maple glazed goat meatball with smoked ricotta, wild leeks and sourdough bread. Serenity Lavender/North 42 Degrees offered their sauvignon blanc, riesling, pinot noir, cabernet franc, cabernet sauvignon and gewurtztraminer. Quai Du Vin Estate Winery had their Aurore-Muscat Petillants 2015 and their Red 2014. Railway City Brewing Company had their Crew Craft lager, The Witty Traveller, Dead Elephant ale and Gypsy beers to sample. We spoke with Paul Spence of Lo Maximo Meats (also the supplier of the goat meat to sixthirtynine) who explained his involvement with the non-profit organization, C-K Table. C-K Table promotes the local food awareness through education and events where the public can get to know their local farmers and artisans. The Arts & Cookery Bank had homemade alcohol infused marshmallows in various flavours like Ba’nana Mellow Cuties, Kahlua and Baileys Fusion Mellow Cuties, Pink Ladies Mellow Cuties, and Plain Jane Mellow Cuties. Clovermead offered root beer honey spread and maple honey spread. Las Chicas Del Cafe sampled their Bourbon coffee. There was the very unique Canadian Breakfast Chocolate (chocolate blended with maple syrup, cinnamon and topped with candied maple chipotle bacon) from Chocolatea. Habitual Chocolate had a variety of bars including mint, 70% cacao, 85% cacao and 100% cacao. Their melodia chocolate is a blend of Peruvian and Dominican milk and dark chocolate. It was an absolute pleasure to meet Amarjit Singh of Local Dairy, and we got seduced by Local Dairy’s spicy grilled cheese made with their award winning Chihauhau and Oxaoaca cheese with Makhani (cultured butter). The Oxford County Cheese Trail had many cheese producers offering top quality cheeses. We also enjoyed Gunn’s Hill 5 Brothers‘ artisan cheese and Brigid’s Brie. Mountain Oak Gouda had their gold, wild nettle, black truffle and smoked varieties available. The Elmhurst Inn and Spa provided Ontario pulled pork with Forty Creek BBQ sauce, Gunn’s Hill 5 Brothers’ cheese, apple, cabbage slaw, and Jakeman’s maple vinaigrette on a baguette. Colio Estate Wines had their Girls’ Night Out Sangria and Chardonnay, Lily Sparkling VQA and Bricklayer’s Cache Small Lot syrah. Cooper’s Hawk Vineyards provided their chardonnay, rose and their touche. Muscedere Vineyards had their merlot and riesling. We also learned about the history of Jumbo the Elephant, who sadly met his demise in St. Thomas. To balance off all of the fine food and drinks, there were wheatgrass shots from Slegers Living Organic Greens, lavender products from the Purple Road, and tea and honey from Wildflowers Tea. Ontario Southwest musicians Gareth Bush, Zach McCabe and Colin Gray performed throughout the event. It was a lovely evening and experiencing the amazing food and drinks from Ontario Southwest was a worthwhile experience.